According to the calendar, we have to wait 2 more weeks for the ‘official' start of Spring. But in my neck of the woods, the southeastern coast of the US, spring has been making a few hits and runs. It will be beautiful and 70° one day, and then rainy and high in the 40°'s the next. That's O.K….with each sunrise we get that much closer to full-on spring meaning it's time to start noodling spring decor ideas for the home! If you're like me, the arrival of spring is defined by the new, green growth that begins to burst everywhere. This year, I ‘nudged' spring along a bit by forcing some of the green growth we're all craving about now, I wanted to have bursts of green growth to decorate both inside and out the house. I needed a new planter on my front porch to replace one that had seen better days. I found a great cement one but it was the wrong color. Not one to let a minor color change deter me, I brought this planter home and gave it a light wash in a grayish black to work with the rest of the planters on my front porch. 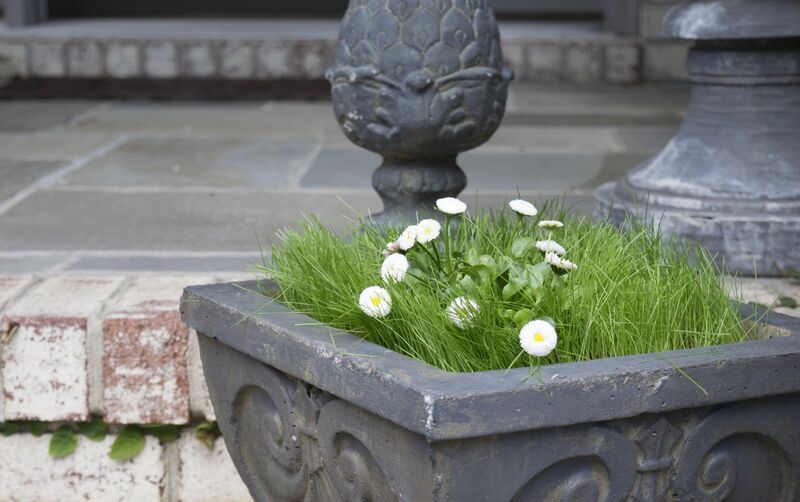 Once the planter was the color I wanted, I filled it with dirt, a cute little English Daisy I found at Lowe's and sprinkled the dirt with Kentucky Fescue seeds, which is a great cool weather grass. 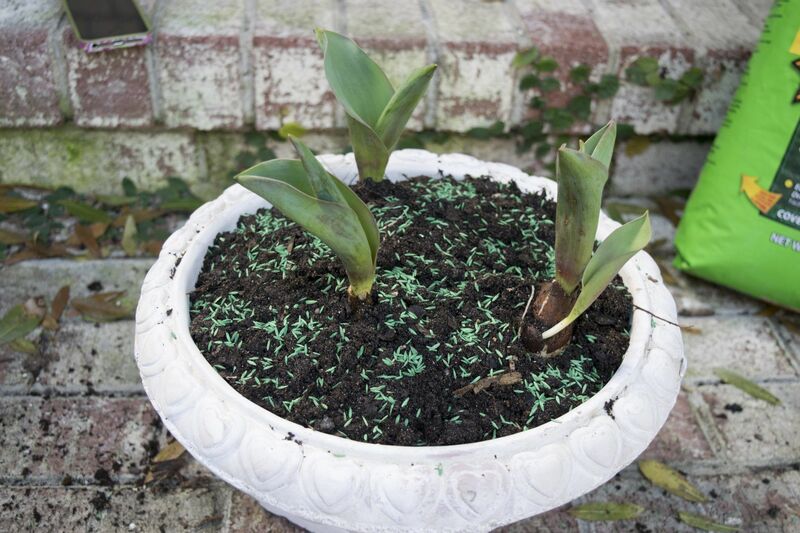 At the same time, I decided to fill another white concrete pot with just spouted tulip bulbs, potting soil and more seeds. I figured this would be perfect spring decoration inside my home once spouted. And because the ‘grow thing's bug bit me hard that day, I also planted sprinkled some grass seeds over some dirt in one of my grandmother's tea cups. MUST.GROW.THINGS! I put both pots inside, under grow lights and after 2 weeks, they look like this, after a bit of a haircut. The little teacup would be perfect at an Easter Dinner table. If you started in the next couple of days, kept your seeds moist and under grow lights, you could easily have these for your Easter table. This pot, with it's blooming tulips, is perfect just about anywhere, but I'm loving it in my living room in front of a nice, bright window. I made the little nest with some spanish moss I pulled from a nearby tree (the stuff grows prolifically here in the southeast) and some moss from an earlier project. 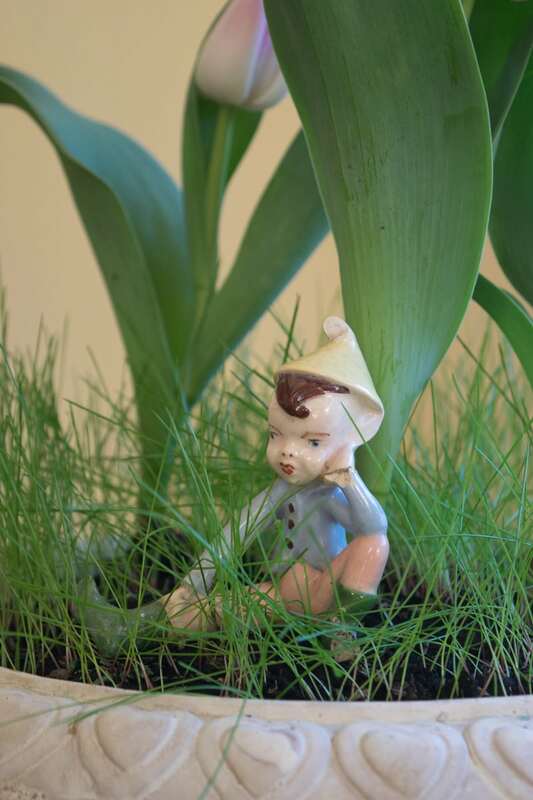 I couldn't resist adding my Grandma's porcelain elf to my tulip pot. This elf normally sits on my kitchen windowsill, but often makes his way into my spring decor. He's a little chipped in places, but he without a doubt, one of my favorite things. I was also excited to do something fun with this great chipped plant stand I found right before Christmas. I put poinsettias in it for my deck at Christmas time, but it's been sitting empty since then. 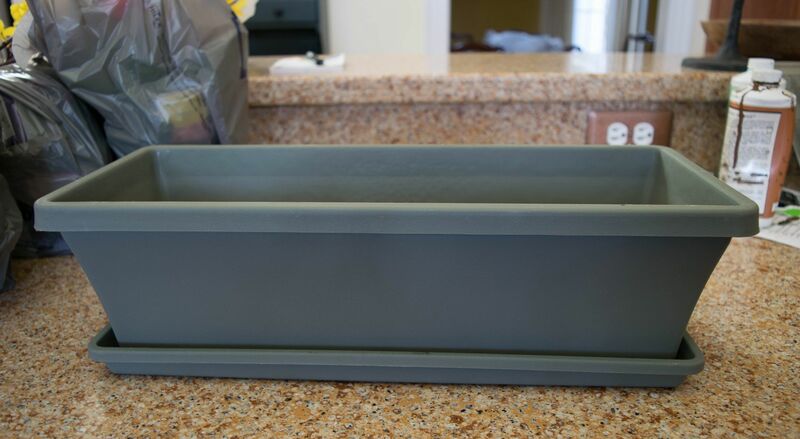 I found this 24″ plastic rectangular planter that would fit perfectly in the planter and would also be the perfect size 3 gerber daisy plants. To dress the planter a bit, I wrapped it in a sheet of moss and tied it with twine. I found ‘spool's of moss at my local Michaels…and they were 50% off! The sunny gerber daisies (which are cold hardy to 32°) in the planter make a bright and cheery welcome at my side door. 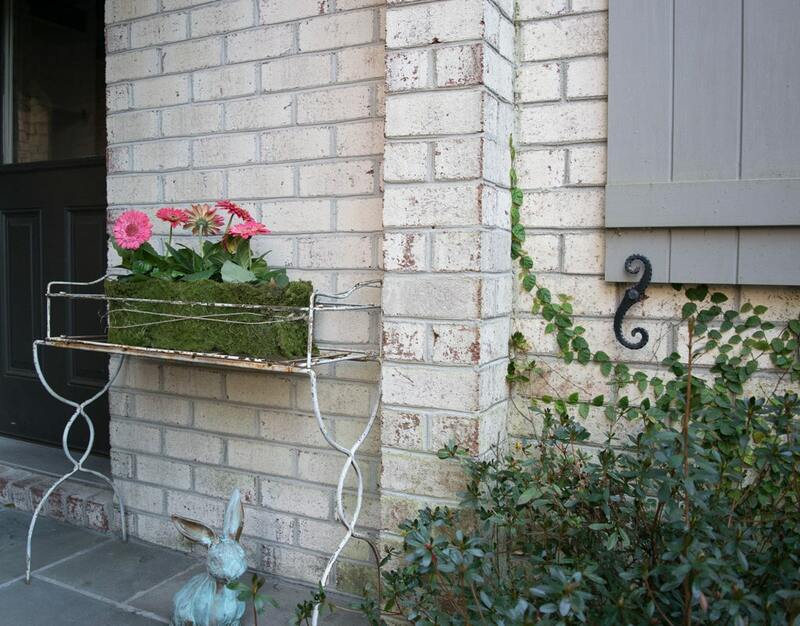 And wrapping the planter in moss is an easy way to camouflage a rather utilitarian, but non-descript, planter. My big question, is what to do with the planter. I love the chippy/rusted-ness of it, but it is rather lost against my off-white brick. Suggestions? 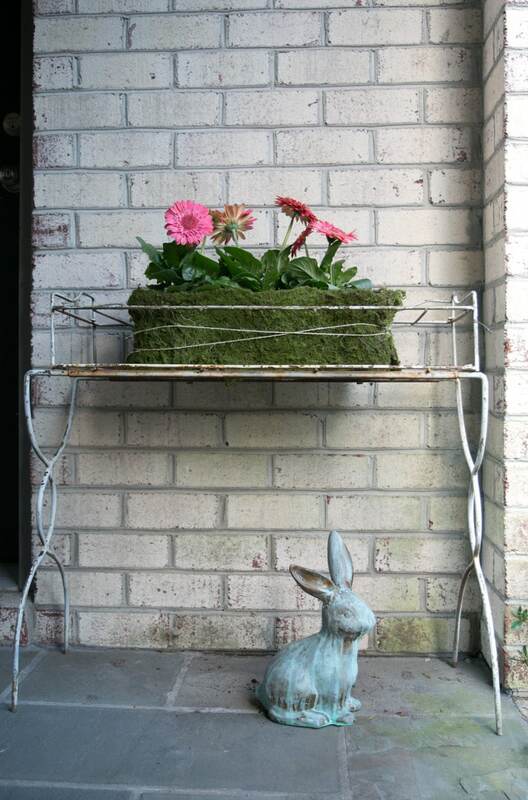 The little ‘verdigris' bunny was my last little DIY spring project. This ceramic bunny has worn many cloaks. It started out as an off-white bunny probably 10 years ago. Shortly thereafter I painted it silver. Then it went black (yeah…not sure what I was thinking on that one) for a brief period before it went silver again. It was actually a fun process to watch the transformation from silver to verdigris. The first step, painting her copper, made her look like a big chocolate Easter bunny! So, my front door, my side door and some spots in my home look a little ‘spring-ier' thanks to the recent ‘spring-i-fication'. But I have to say that my soul feels a little ‘spring-ier' too. 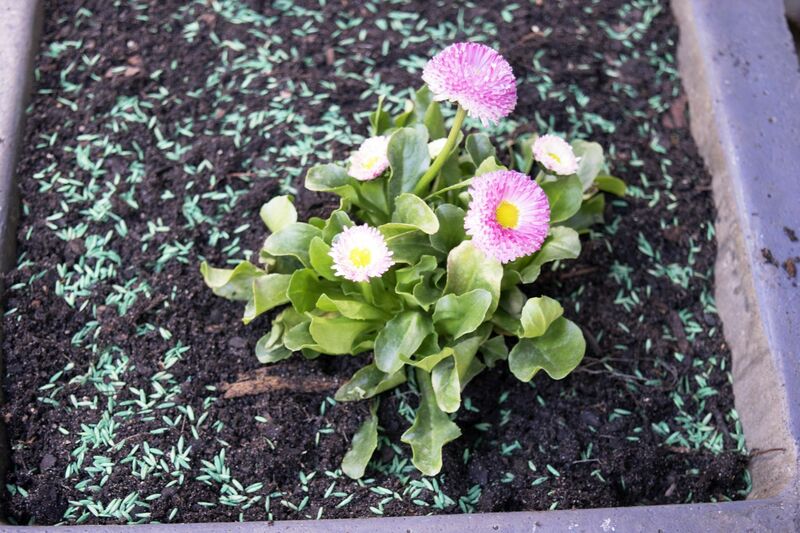 The moral of this story is… if you're looking for some spring decor ideas for your home, find some grass seeds, some spring plants, a few DIY spring projects and nudge spring along a wee bit. I really do appreciate your company more than you'll ever know and hope you’ll stop by again soon. If you want to make sure you don’t miss future content, pop your email in the beige box up on the right. I usually send out 2-3 emails a week, so I won’t inundate your inbox. Oh Lynn… if your projects don’t spell spring, I don’t know what would! 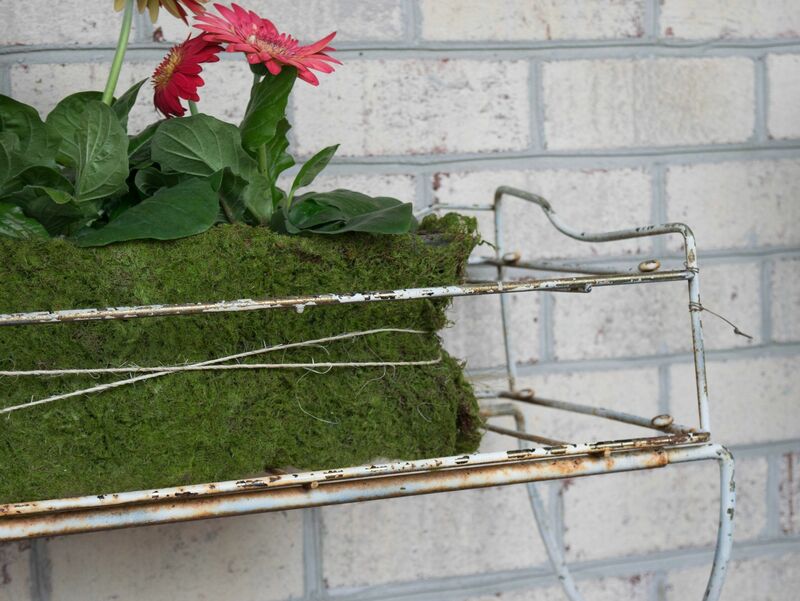 Your moss planter is the coolest! And that bunny totally looks like chocolate before the coolness of the rust entered the picture… NEAT! And now I really REALLY want to plant grass. You’ve encouraged me! Hello Donna, so glad that you swung by today. I’m so glad that I may have encouraged you to plant some green grass to get your spring kick-started. It really was an easy, quick way to get a quick spring fix. 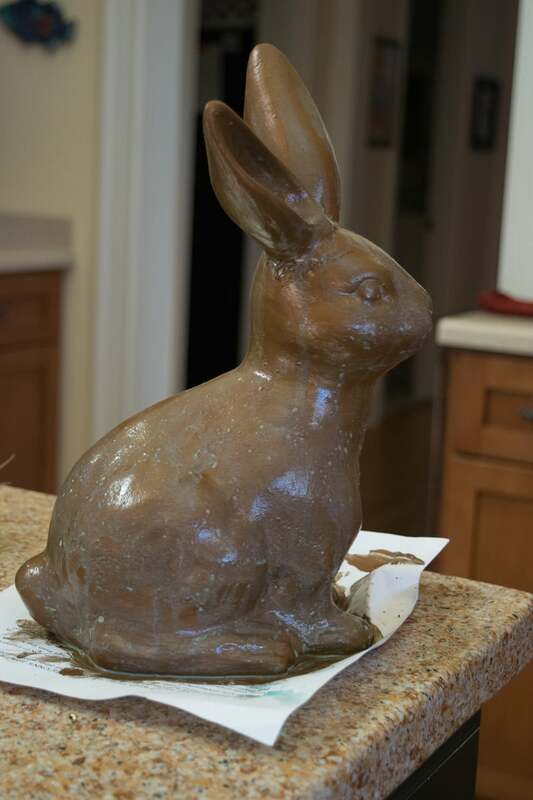 And I’m really tickled with how that bunny turned out…it really doesn’t look like it’s ceramic…really looks copper. Thanks for all the shepherding you do for us on Blogtalk. Your guidance is greatly appreciated. I love all of your planters but the teacup is my favorite! Hi Cecilia…I’m so tickled with the teacup as well! And it really was an afterthought…a complete last minute kind of thing. I love it when those ‘last minute’ things turn out better than what you had originally planned! Thanks for swinging by today! Lynn….what can I say! I love it all! That planter is truly mine I think! 😉 And not to speak of the plant stand, OMG, love it! Also mine! 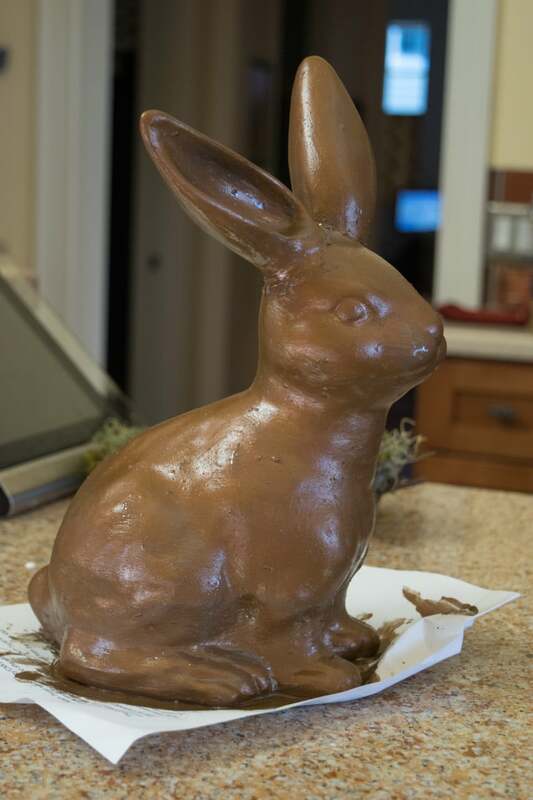 And the bunny turned out not chocolaty at all, lol, how cool! I’d love to find moss here, it’s great for decorating and how you simply wrapped it around the plastic planter makes me want to go and order some! 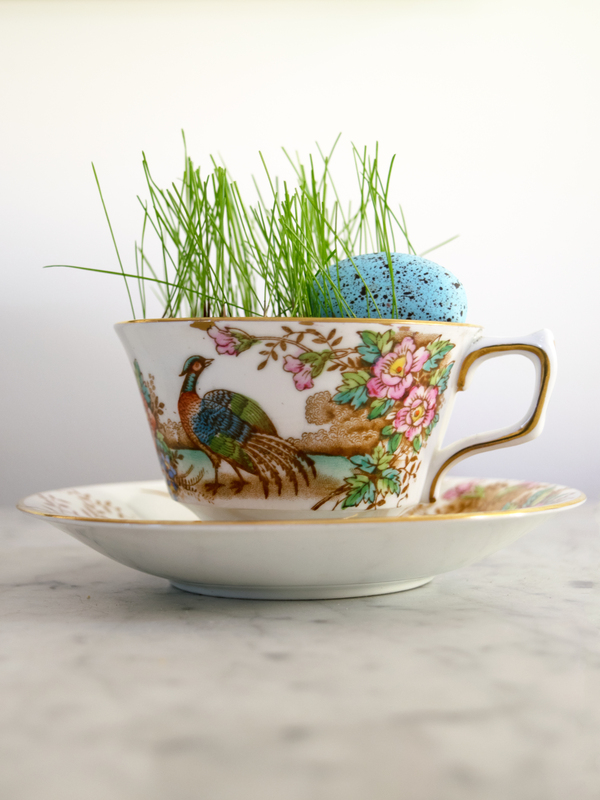 And now to my favourite idea of the year: sowing grass seeds into a tea cup! and that planter! Lynn I’m so gonna copy this idea, it’s so simple and lovely! I have my moms teacups stored away so they don’t break, actually one broke on the move to Europe, but I’m gonna try this, it’s too nice! And that little elf from your grandma fits right in the grass! How cute! Just reading this makes me want to start decorating my porch for spring. I thought it was too early for some flower planting but you have inspired me! Hi Ragan, there really are quite a few plans that are suitable for planting at this time of year. And the grass will grow quickly and will add to whatever else you plant! So thankful you swung by today with your kind comments. And I”m looking forward to reading your ‘snarky new series’! My goodness Lynn, you have really been busy! This beautiful post took lots of time and energy. I have not got one green thumb in my body and I greatly admire people who can plant and have such beauty around them. So my hat is off to you on this one! The teacups with the greenery are super adorable. As for the rest of your creations, they remind me of an old villa that is full of patina, on the hills of Tuscany. Everything is rich with history whether it was there originally or not doesn’t matter. You make it all look so full of aged beauty. You have created a villa fit for a Baron! Happy Spring Lynn!! What a fun post, filled with SPRING enthusiasm! I always look forward to your beautifying suggestions (I have been knitting up a gift stash of washcloths!). Might you consider spraypainting your plant stand black to make it stand out? I notice a decorative black something on your house to the right in your picture. Whatever you decide, I’m sure it will be perfect! Hi Conni…thanks so much for your very kind comments and I’m so glad you are enjoying the washcloth patterns. Truly, is it possible to have too many washcloths? I think not! And I had fun putting ‘spring’ in my home! That’s one of the benefits of blogging…it keeps me getting stuff done that I want to get done! I have considered spraypainting the plant stand black…it’d be easy to do if it weren’t for the fun rust/chipping. And who thought I would ever want to keep rust and chipping? Super cute patina bunny!! I love the aged look you gave it, and I also adore the teacup grass. Anything in an old teacup just simply looks more cozy. What is it about old teacups…they are quite lovely aren’t they? I especially love the colors in the one I planted the grass in. And the little bunny turned out better than I had hoped. He does look like he has been sitting in the elements for ages…developing that wonderful patina. Who’d a thunk that it took all of 15 minutes to turn? It was really very fun. I have to tell ya, I’m looking around my house for things that need a bit of quick patina. I think I’m hooked. Oh, so glad! I’m sure there are other products out there, but the stuff I used worked like a charm. Have fun with your ‘patina party’. I love the idea to add grass to the pot as cover. It looks lovely! Tulips are one of my favorite flowers. I need to get mine planted. I’ve got it on my planner to spruce up my front yard this week too. It’s going to be so nice here! Hi Tanya…so glad to hear from you today! I am quite tickled with how the grass seed did add some almost ‘instant’ green to my pots. And I’m with you about tulips…they are such beautiful harbingers of spring…just wish they lasted longer! And we are looking at a beautiful week here in the Carolinas! Enjoy. I will actually be up in your area this weekend, sitting INDOORS at a Robotics competition. It’s going to kill me to not be out in the sunshine. Oh well…it is what it is! 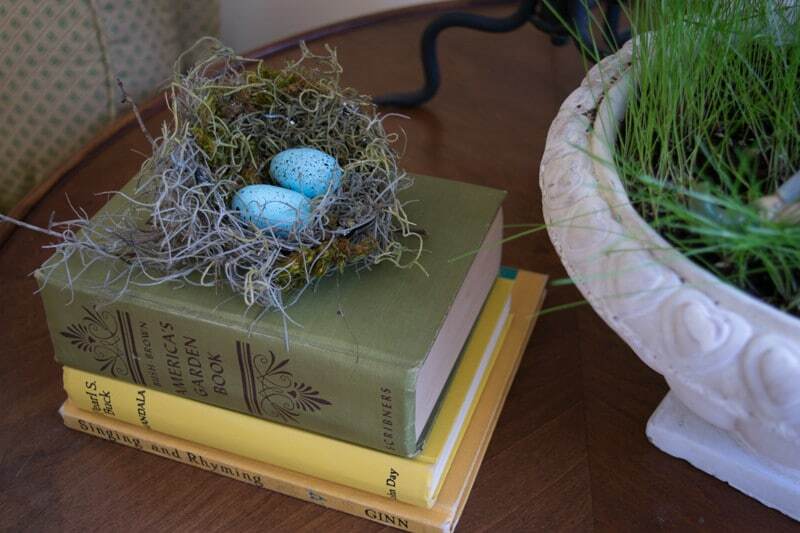 I love, Love, LOVE everyone of your ‘spring-i-fication’ decor touches! I originally came to your blog because what you did with the teacup really caught my eye and then you had loads of more wonderful ideas! I love how you took old and made it new and everything is so creative and delightful Thank you for the inspiration! Thanks so much Thea! Such a sweet comment…those make my day! I’m so glad I may have inspired you a wee bit! It was one of those things where one thing led to another…you know how that works, right? I just couldn’t stop putting grass seed on things. And it’s funny, the teacup, which I also just LOVE, was the very last thing I did, very much as an afterthought…but I do love it. Once again, thanks for your sweet commnet! Wishing you a wonderful, spring-y Monday! 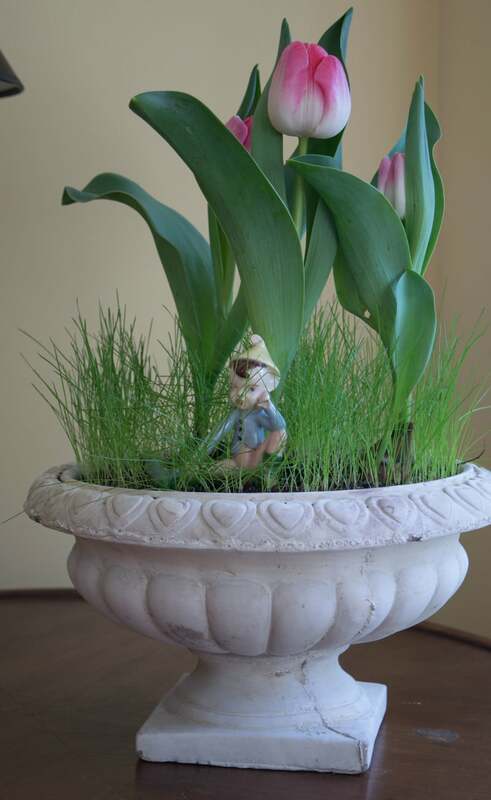 Lynn, I love how your pot with the tulips look, the moss wrapped, planter, the bunny, grass, nest; OK, everything you did was really awesome. Today is really the first day it feels like spring is coming, and even as I write this, there’s still patches of snow on our lawn. After we return from Texas, I’m going to try and spruce up the outside to look a bit more springy.. It really does look like spring at your house. Great job! Thanks Kim! I had a fun time with all of them and they all took very little time. 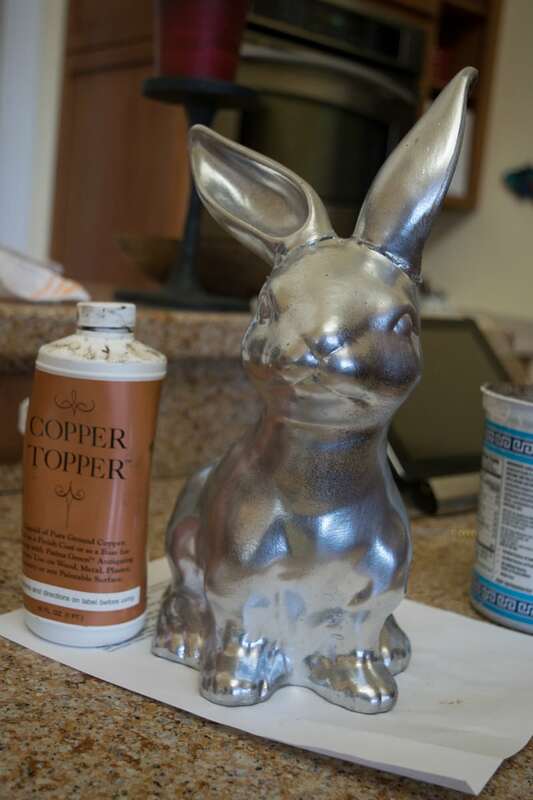 The bunny was especially fun to watch its progression from silver to copper to patina’d. Looks like it’s been sitting in the elements for ages. 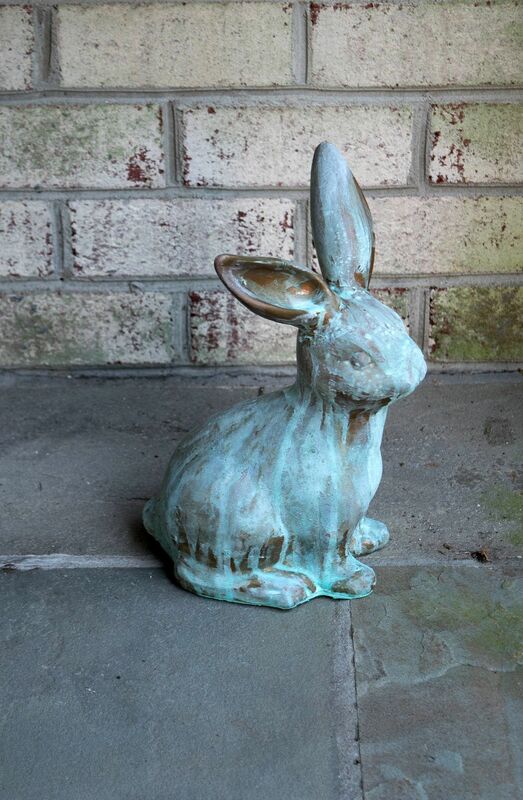 No one would believe that there is a cheap, ceramic bunny underneath all that beautiful patina! Thanks again for swinging by for a visit. Thanks Liz…you know, that teacup was a last minute afterthought and it is my favorite thing too. Wouldn’t it look great at an Easter dinner? Now that the weather is warming up, I’m really feeling the spring bug…everything is starting to pop! Hi Holly, thanks for swinging by. The teacup was one of those unexpected, last minute thoughts that turned out much better than I had thought. And isn’t it wonderful when that happens? And wishing you a week equally full of sunshine and spring. Aw thanks Michelle for your sweet words. All this spring-y things were so easy to do…sometimes you just need easy. I’m sure your houseplants would love to have some company! That elf of my grandma’s is one of my most favorite things and he always brightens wherever he lands. Wishing you a wonderful day and a beautiful spring! Wow, so many beautiful touches of spring. Moss of course, great minds and all, 😉 The teacup is gorgeous, your bunny, and the green, green,, grass. Spring has sprung. Very inpspiring! The bunny and the planter turned out beautiful! Thanks Maria…I’m really pretty pleased with the bunny and planter as well. And they were so easy to do!! So glad you came by today…thanks. Aw thanks Coco…I’ll be honest, I pretty much squealed outloud when I pulled into the parking lot of the antique’s store and saw that cute planter sitting right out front…KISMET! I brought it home and gave it to my husband so that he could give it to me for Christmas. Do you ever do that? And thanks for the love on the bunny and the teacup as well…so very much appreciate. Hope you are enjoying your Florida spring! This post really gets us all ready for Spring! Love the tea cup! So pretty! Hi Ilka…I’m so glad that I may have put a wee bit of spring into your inbox! And I love those teacups as well…they were my grandma’s so they hold a special place in my home and my heart. Thanks for swinging by today. Lynn, I am so jonesing for spring, and these are some really fresh, pretty projects! I have been looking at garden seed catalogs, I can’t wait for the garden planting time! I have wanted to plant a wheat grass planter for the center of my dining table, and your post may have pushed me over the top!!! 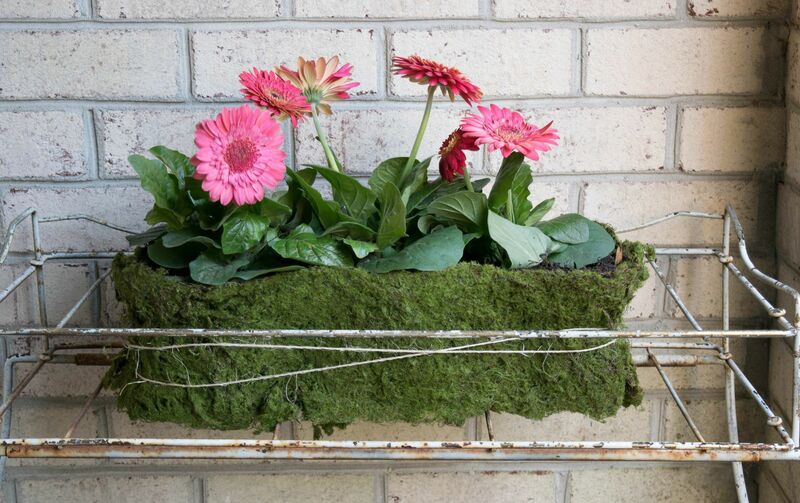 I love the way you’ve wrapped the gerber daisy planter in moss, it’s so cool looking!!! 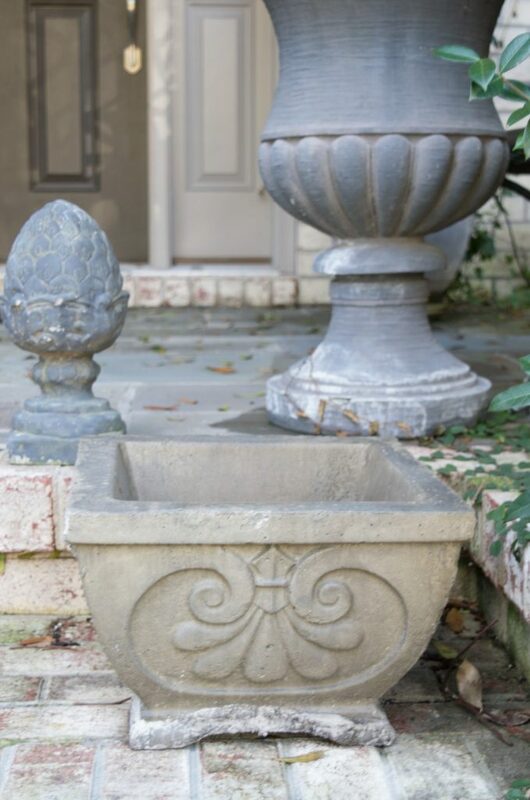 I really love the chippy paint planter, I’m not sure what you could do to alter it to set it apart from the brick. I love it so paint would not be my suggestion, what about wrapping a vine around it? Hi Nikki…yeah, not sure what I’m going to do with the planter…think i must need a new house so that I don’t have to paint the planter!!!? And I’ve been thinking about wheat grass too! It’d look pretty and you could ‘harvest’ it for smoothies too! That’d be fun. Spring is almost here Nikki…hang on! Hi Christina! So glad that you came by and left your kind comments. 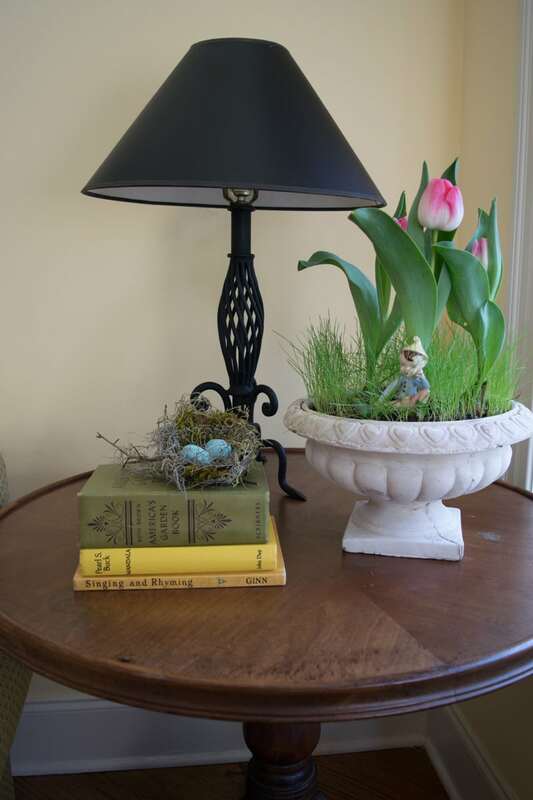 These little projects did get me ready for spring and I’m still enjoying the spring boost they are adding to my home. I hope that spring is starting to peek out in your part of the world.